Americans woke up to a whole new reality on November 9th when Donald Trump’s sweeping presidential victory defied all polls, pundits and political odds. At the beginning of the GOP campaign, Trump was mocked, shunned and given up for lost in the early stages of the race. He was even publicly denounced by Mitt Romney, marking the low point of the GOP’s revulsion toward the Trump nomination. Like the ugly duckling in the childhood fable, however, he persevered, and in the meantime tapped into a simmering sense that politics is broken, and maybe a bulldozer is what’s needed to change it. But unlike the fairy tale, his shocking election win turned him into a black swan, not a white one. 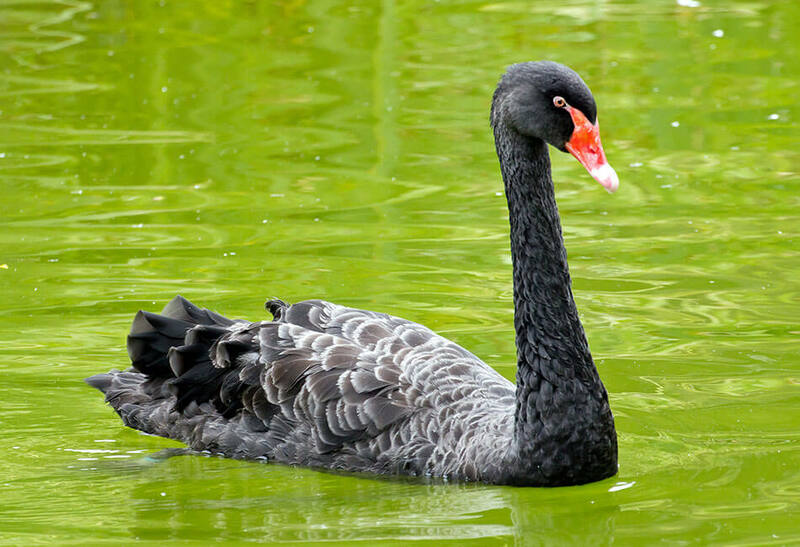 A black swan, in financial markets, is an event that is not only extremely rare, but one that has extreme side effects. We can count on Trump’s approach to the presidency to be unlike any of his predecessors, and unfortunately this makes forecasting policy difficult. The significant changes he and the GOP are telegraphing are apt to dramatically change the landscape for taxes, regulation, and trade. The bullish reaction of the stock markets imply an expectation of a Reagan-like turn in fiscal policy. Bond markets, in turn, fell (i.e. interest rates rose) as prospects for bigger government deficits were embraced, along with faster growth and higher inflation. But Trump faces several hurdles to mimicking the Reagan growth plan, making the outcome far less certain than Wall Street seems to believe. Trump’s tax proposals are certainly the boldest since Reagan’s, as he plans to slash the highest marginal rates, cut corporate income taxes and capital gains, and eliminate the inheritance tax entirely. At the same time, he seems committed to a large increase in government spending on infrastructure investment. Such stimulus is exactly what many economists have been calling for over the last few years, and higher inflation would be a welcome change from the specter of deflation that has stalked western economies since 2008. Trump’s first hurdle will be to avoid financial instability. In the early 1980s interest rates were at secular highs (remember the 21% prime rate?). These high rates drew in money from abroad, causing the value of the US dollar to rise some 40% from 1980 to 1985. As a result, many emerging market economies in Asia and Latin America were crippled with dollar denominated loans that the strong dollar made impossible to repay. Many American banks were caught with defunct loans, pushing some, such as Continental-Illinois Bank, into insolvency. Today, most emerging market economies hold far less dollar denominated debt, but if higher rates continue to strengthen the dollar, a chaotic bout of capital flight may occur, hampering the buying power of the very customers Trump wants to buy our exports. This is already happening in China, as a depreciating local currency (Chinese yuan) is prompting expatriation of money and the imposition of capital controls by the monetary authorities. A related hurdle centers around international trade. Trump’s centerpiece promise to voters was to bring jobs back to the US, and punish companies that move jobs overseas. As the dollar rose in the 1980s, the US measure of exports minus imports (the “current account”) moved from a small surplus to large deficit, indicating a surge in the purchase of relatively cheaper imported goods. Efforts in the early 1980s to politely convince trading partners to limit their exports gave way to more serious interventions later on, which contributed to the 1987 market stock market crash. The muscular rise of the US dollar since election day may feel patriotic, but if it continues, will have an unintended effect on Trump’s plans. Faster growth and higher interest rates may attract foreign capital, pushing the dollar even higher. That will make US exports more expensive on world markets, and imports cheaper, probably hampering a manufacturing revival in the struggling towns that helped Trump win. Already the Mexican peso has fallen about 10% since the election, boosting that country’s competitiveness relative to their American counterparts. Responding to these changes will be trickier than in Reagan’s day. Sprawling supply chains around the globe make punitive tariffs as likely to hurt American firms as foreign ones. Finally, the interest rate environment could not be more different between the Reagan and Trump eras. In the dark days of the early 1980s, interest rates were sky high, as were inflation expectations. Courting immense unpopularity, Fed Chairman Paul Volcker eventually “broke the back” of inflation through the use of extremely restrictive monetary policy, and interest rates began to fall and create a virtuous cycle of borrowing, refinancing, and consumption. Though Reagan gets the credit for the boom of the 1980s, it’s important to remember he had an immense tail wind in the form of rapidly falling interest rates. Trump has inherited an economy that has been the beneficiary of extremely accommodative monetary policy, and one that may be at the end of a 35-year cycle of falling interest rates. The current Federal Reserve has clearly moved to end the extraordinary policies of “quantitative easing” and its zero interest rate policy. With the added potential boost from tax cuts and a fiscal spending spree, the Fed has indicated that interest rate hikes may come faster and more frequently than expected. Our November Market Outlook was entitled “What’s Going Right” and focused on the many positive aspects of the economy that are contributing to consistent, though not spectacular, growth. The business cycle started to look like its normal self over the last eighteen months, and with it some capacity constraints are starting to show. To embark on a massive stimulus program at this stage, Trump may find himself a black swan swimming against the tide of pressures he has least counted on. Stocks and bonds parted ways in the aftermath of the election, with stocks rising to record highs and rising yields pushing down the prices of bonds and every other income-oriented security. Stock investors are clearly seeing the glass half-full, and are counting on a combination of tax cuts and stimulus spending to drive business prospects higher. 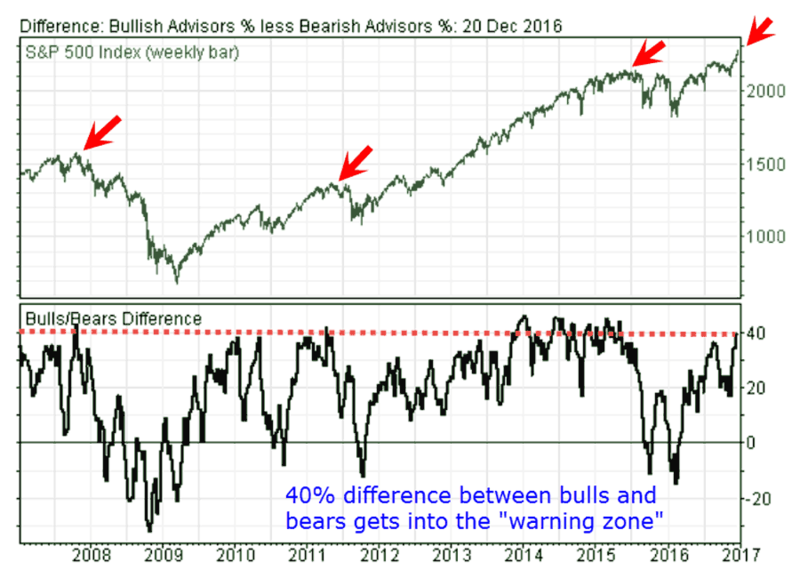 Today’s spread between bullish and bearish analysts is just a hair over 40%, a level which, ironically, points to lots of “hope” among investors, but a level consistent with the high water mark for stock prices in 2015 and 2016. Thus, expectations are high, and it would not surprise us to see a market decline to greet the New Year. Margin debt has also remained at elevated levels, and is just below the cyclical peak reached in May 2015 (consistent with bullish sentiment peaks above). This is typical behavior in bull markets, as leveraging portfolios through the use of margin debt magnifies gains. In fact, it helps propel stocks as higher prices beget more margin debt, which pushes prices higher. It is the unwinding of this trend that we are watching for, as leverage cuts both ways, exacerbating the down moves in a bearish market. It will take a consistent market decline to bring about the negatives inherent in high margin debt levels, so for now it is a risk factor on the horizon, much like the approach of summer thunderclouds. The NYSE advance/decline is clearly supportive of the post-election rally, as it has moved to a new high. This indicator actually was fairly sluggish as the post-election rally progressed, which was indicative of the split nature of the market. Growth stocks were rising, but interest sensitive stocks such as utilities were falling, resulting in an advance/decline line that didn’t (and still doesn’t) look nearly as robust as the price indices. But it is moving higher, and that confirms the legitimacy of the rally. Finally, higher interest rates are providing a head wind for stocks that has not been present the last few years, as rates were pinned near zero percent by the Fed’s aggressive monetary policy. Here, too, investors are acting as if higher inflation in 2017 is a foregone conclusion, and have dumped bonds with gay abandon. But if future trade policy takes the “black swan” form of a trade war, global growth may actually slow, putting downward pressure on yields. The promise to bring back jobs can be achieved in several ways, but a protectionist, beggar-thy-neighbor approach is a risky way to provide them. Sentiment in the bond market is very, very depressed at this point, the mirror image of the mood toward stocks. Being a contrarian indicator, this is actually positive for bond investors. We would therefore expect bonds to rally as inauguration day approaches, as higher yields attract income investors, and the likely pullback in stocks leads to a flight to safety, at least in the short term. For both stock and bond markets, the watchwords for 2017 will be to expect the unexpected, and not be surprised if flocks of black swans cross our path.